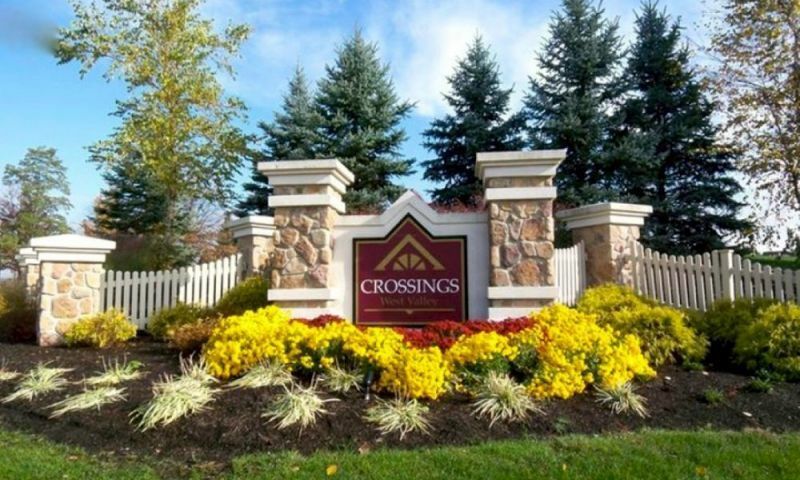 Crossings at West Valley is an active lifestyle community located in Brunswick Hills, Ohio. This low-maintenance community is made up of attached and single-family homes within a small village-like setting. Crossings at West Valley features maintenance-free ranch homes with luxurious fixtures and a clubhouse with resort-like amenities. Residents can enjoy their spare time doing fun activities instead of worrying about home maintenance hassles, which makes living at Crossings at West Valley a delightful experience. The 3,000 square-foot clubhouse at Crossings at West Valley is the central hub of this active lifestyle community where recreational, social, and fitness activities happen daily. The clubhouse gives residents a sense of resort-like living with access to amenities like a catering kitchen and multi-purpose room. The catering kitchen is fully-equipped with kitchen essentials, so cooking a feast for a potluck party with your neighbors is a breeze. Homebuyers can also relax in the multi-purpose room, play cards, watch a movie or just gather around the sitting area and entertain friends with a game of charades. A billiards table is also available for residents looking to play pool with a neighbor. For the health conscious residents, the clubhouse has an exercise room that is equipped with cardiovascular and weight-training machines so residents can work out on their own schedule. The heated outdoor pool is available for those seeking more physical activity like swimming a few laps. Homebuyers can choose to hang out and relax by the outdoor patio with a good book as well. Epcon Communities began constructing Crossings at West Valley in 2005 with plans for approximately 128 homes at completion. The one-story ranch homes come in two collections and five different floor plans. The Cathedral Series features homes with vaulted ceilings, gourmet kitchens, spacious master suites, and European-inspired exterior designs. The Cathedral models are attached homes and range in size from 1,718 to 1,911 square feet. They come with two bedrooms, two bathrooms and a two-car garage. One of the models within the Cathedral Series includes a den that can be converted into an optional third bedroom. The Courtyard Series include single-family homes that range from 1,516 to 1,994 square feet in size. These homes come with two bedrooms, two bathrooms and two-and-a-half-car garages. Some homes also come with a den. Models in this series feature tray ceilings, open layouts, gourmet kitchens and private courtyards that are perfect for entertaining guests or relaxing with a glass of wine. Residents in Crossings at West Valley can benefit from the hassle-free lifestyle of homeownership due to the professionally managed association. The homeowners' association fee includes lawn care, fertilization and weed control, snow removal, landscape maintenance, exterior building maintenance, common area lighting, driveway and street care, clubhouse maintenance. Crossings at West Valley is located in the quiet country setting of Brunswick Hills, Ohio and is only a short drive from Lake Erie. The Brunswick Hills area provides residents with privacy and peace of mind because of its tranquil environment. It also provides residents with easy access to nearby larger cities like Akron and Cleveland for a taste of urban living. Restaurants, shopping centers, and medical facilities are only minutes away from the convenient location of Crossings at West Valley in Brunswick Hills, OH making it a remarkable place to call home. There are plenty of activities available in Crossings at West Valley. Here is a sample of some of the clubs, activities and classes offered here. These attached ranch-style homes feature vaulted ceilings, gourmet kitchens and spacious master suites. Models in the Cathedral Series range in size from 1,718 to 1,911 square feet. They have two bedrooms, two bathrooms and a two-car garage. One of the models within the Cathedral Series includes a den that can be converted into a third bedroom. Single-family homes range from 1,516 to 1,994 square feet in size. These Courtyard Series models come with two bedrooms, two bathrooms and two-and-a-half-car garages. Some models also come with a den. These homes feature private courtyards and basements. Crossings is a very nice little neighborhood with friendly people and best of all, NO home maintenance. I wanted a nice, new place I could easily afford that didn't require any snow blowing or lawn mowing. I am so happy to give those annoying jobs to someone else! I spend that time working on my own health now, using the gym, taking walks, swimming and socializing! 55places.com is not affiliated with the developer(s) or homeowners association of Crossings at West Valley. The information you submit is distributed to a 55places.com Partner Agent, who is a licensed real estate agent. The information regarding Crossings at West Valley has not been verified or approved by the developer or homeowners association. Please verify all information prior to purchasing. 55places.com is not responsible for any errors regarding the information displayed on this website.